I know. Tiramisu for breakfast? It seems so naughty. 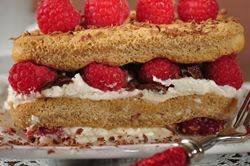 But this is not an actual Tiramisu, it just borrows some of its components; mainly ladyfingers and coffee, and layers them with ricotta, shaved chocolate, and fresh raspberries. For a little history; Tiramisu is an Italian dessert invented in the 1960's at the El Touga restaurant in Treviso, Italy. Literally translated 'Tiramisu' means "pick me up" or "carry me up", which probably refers to the jolt you get after eating espresso-laced ladyfingers. A Breakfast Tiramisu uses ladyfingers, a finger-shaped cookie that is about 3 1/2 inches long and 1 inch wide (8 x 3.5 cm), made with a sponge cake batter. For this dish I use store bought ladyfingers (a real time saver) because they are thicker and their texture is crisp yet very absorbent, so they keep their shape even after being dipped in coffee or espresso. Once the ladyfingers are dipped in coffee, they are layered with ricotta, shaved chocolate, and fresh berries. Ricotta means "recooked", and is a rich Italian cheese made from the whey (watery residue from making other cheeses, like mozzarella) that is cooked to produce a mild, nutty tasting, soft and moist, yet grainy white cheese. It is very similar to our cottage cheese only it is very perishable. Keep this in mind when buying ricotta, as once you open the container it needs to be used within a few days. Ricotta comes in whole milk, low fat, or part skim and in this recipe you can use whatever type you like, just try to buy a ricotta that does not contain a gum stabilizer (Calabro brand is very good). This dish does benefit from being made several hours or even the day before serving. This gives the ladyfingers time to soften and allows all the flavors to meld together. Although this recipe only serves two people, it can easily be doubled or tripled. Breakfast Tiramisu: Have ready 2 - 6 ounce (180 ml) dessert glasses or bowls. In a small bowl, whisk the ricotta with the sugar and vanilla extract. Taste and add more sugar and/or vanilla, if needed. Place the espresso (or coffee) in a large shallow bowl (add sugar if you like). Spoon about 2 tablespoons of the ricotta mixture into each bowl. Sprinkle with a little chocolate and a few berries. Dip the ladyfingers in the coffee and lay 2 ladyfingers in each bowl. Repeat the layers: cheese, chocolate, berries, ladyfingers. Cover each bowl with plastic wrap and place in the refrigerator for at least four to six hours (preferably overnight) to allow the layers to blend. Serve cold. Serves 2 people. Preparation time 30 minutes.